Although men are the most susceptible to hair loss, a large percentage of women also lose hair, a problem that can be just as devastating if not more so to their psyche. An estimate has been given of 30% of women over 30 years of age who lose hair. This is an alarming statistic but one that can be readily solved or at least improved by medicine and/or surgery. Women lose hair for a variety of reasons: genetic, medical, or environmental causes. It is more important in women than in men in many cases to perform a thorough medical evaluation before contemplating a surgical procedure in order to avoid unnecessary or unsuccessful surgery. For instance, after childbirth women can shed massive amounts of hair due to the release of the estrogen influence on their hair, a condition that corrects itself over several months without need for intervention. However, minoxidil can help accelerate the return of hair growth more quickly in these cases. Other causes of hair loss include tight braiding, as commonly worn by women of African descent. This condition unfortunately is oftentimes irreversible and may mandate surgical hair restoration but nevertheless responds well to surgical intervention. A thorough medical and physical examination should be part of every initial workup including evaluation of the scalp for signs of abnormal disease that may require a skin biopsy to rule out abnormal disease processes like lupus. In addition, a medical workup for basic laboratory abnormalities should be included in most cases with a study of the iron level, male and female hormones, thyroid levels, basic chemistry values, and possibly sedimentation rate that might indicate an autoimmune disease. Working with a skilled and knowledgeable internist, family doctor, or dermatologist may be a good start in this process. Minoxidil, or brand-name Rogaine, can also be very important for two reasons. First, it may stabilize or reverse the hair-loss process in many women. Second, because women are susceptible to shedding, albeit temporary, of their hair following a surgical hair transplant it is important to be on minoxidil for a few months to minimize this risk. Even following a surgical hair transplant it would be advisable to continue minoxidil to minimize this possibility. Surgery can be undertaken to match the type of female hair loss pattern that occurs, typically in one of three patterns. 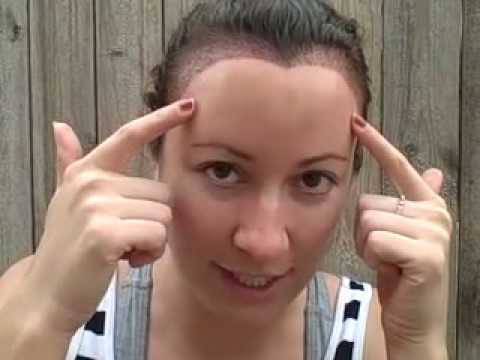 The first pattern is known as male pattern in which women lose hair in the fronto-temporal angles and along the hairline. Although hair restoration would focus to restore this lost hair, the shape of the female hairline is very different from that of their male counterpart in that it is more rounded and closed at the temples. The second pattern has been called a ‘Christmas-tree pattern’ by Elise Olsen in that it appears to be in the aforementioned tree pattern when the woman parts her hair in the midline and gazes downward to the ground. Obviously hair would be focused principally along the frontal area in an area known as the central forelock (the area immediately behind the hairline) where there is the greatest degree of hair loss and can be the most cosmetically sensitive. The third pattern is known as a Ludwig pattern which is more diffuse in nature across the entire center of the scalp and that may extend downward to involve the temples. Hair restoration would be targeted on those areas of deficiency when performing a hair transplant. Like in the world of economics, the laws of supply and demand govern the success of any hair-transplant endeavor. When a woman has extensive hair loss and only limited donor hair from the back of the head then the results can be less than successful. Conversely, if a woman has more limited loss and more generous, usable donor hair then she can be an excellent candidate. Working with a hair-transplant surgeon who has extensive experience with female pattern baldness is a prerequisite to ensuring or optimizing one’s chances for a successful hair-transplant result. Hopefully, this primer on female hair loss and hair restoration can serve as a basis of understanding for someone who is suffering from this condition and provides hope for a possible solution as well.
. He has authored several medical textbooks and published articles.